A person on State welfare starts to have money deducted from his fortnightly giro cheques once his savings exceed £3,000 as shown below. [Still true circa August 2000]. Between £3,000 and £8,000 he loses a proportion of his welfare. His welfare pay­ments are reduced by £1 per week for every £250 or part thereof he has above £3,000. He also at this point starts to have to pay a proportion of the Council Tax levied on his home. A double whammy! The welfare deductions alone thus cause any amount he has above £3,000, effectively to evaporate at a minimum rate of 20·8% per annum. If his total savings stray above £8,000 he gets no welfare, even though he has no income. In the case of a married couple, the figure is exactly the same. Their combined savings limit for receiving the full miserable amount 'the law says' they need to live on is also £3,000. The reason given by those in power is that savings generate income. It is assumed that the poor and unemployed invest all savings above £3,000 at a return on investment [ROI] rate equal to or greater than 20·8%. If anybody in this whole wide world knows where I can invest £250 at ROI ≥ 20·8% please email me. I am given to understand that the London Stock Market averages about 14% over the long term, and requires a lot more than £250 as an acceptable minimum investment. Those in power obviously attribute the poor and unemployed with far greater financial adept­ness than they do seasoned Stock Market traders. Or is a sadistic contemptuous bloody minded attitude towards the poor and unemployed on their part a lot closer to the truth? Of course, they may argue that the income generated is that on the whole of your 'capital' and that they are benignly overlooking that generated by the first £3,000. Thus, the first £1 per week (£52) deduction when your account tops £3,000.01 is equivalent to 1·7% a year earned interest (after tax) as shown at the start of the lower (blue) curve below. The rest of the lower curve shows (in £250 jumps) the net rate of interest which the government assumes a poor or unemployed person's 'capital' earns. The plots stop at the upper limit of £8,000 beyond which all welfare and Council Tax relief stops. The Stock Market may possibly return the 13% shown on £8,000, but I would expect this to require the money to remain invested for a long time. No dipping in for em­ergencies. The upper light blue (cyan) curve shows the same if we exclude the first £1,800. This is the actual transient range on my current account caused by the natural assynchonism between my own domestic receipts and expenditures. But this £1,800 must be kept in a current account in order to expedite day to day transactions. It cannot therefore 'earn' interest. It is therefore wrong of the government to consider it part of a poor person's income generator. The upper curve is the only workable option. However, it does assume that the poor and unemployed have the free services of the most adept investment analysts. One may be able to get a return of 5% on a £1,000 investment (where the light blue curve crosses the 5% line), but doubt it. I am sure I don't know where one would get over 16·77% on £6,200 (top end of light blue curve). In fact I have to keep all my money in one current account as an emergency buffer. I do this simply because I dare not risk incurring the swingeing service and interest charges of going overdrawn without authority. Please remember that one's option to borrow money (including the option to go overdrawn) is 'subject to status'. That essentially means not the poor and unemployed. If the government excludes all of the first £3,000 from consideration, then the curve of 'assumed earned interest' would not, in fact, be the flat red line at 20·8% in the previous graph. It would, in reality, be a diminishing saw-tooth curve as shown on the right. It would start with an 'assumed earned rate of interest' on the first penny over £3,000 of 520,000% (Yes, that really does say five hundred and twenty thousand percent! ), dropping to 20·8% at the first £250 mark, then progressing in a series of diminishing saw-toothed humps £250 wide with a common base of 20·8%. The other curves also have saw-toothed humps. Thus if a poor person saves over £3,000 (What an inheritance to pass on to my three children!) he has at the very least 20·8% APR of it deducted from his welfare. If an ordinary person borrows on a credit card, he is charged interest at 16·4% APR. The rich - those with an income ≥ £20,000 a year - can get a 'Gold' credit card on which the interest rate is only 7·9% APR (Y2K - Lloyds TSB Asset Gold). But one's eligibility for a credit card is subject to status. If you are poor or unemployed, that simply means no! Thus in the capitalist society under which I live, the lesser your need the more you are given; the greater your need the less you are given. It costs the poor more to save than it costs the rich to borrow. The savings limit penalty is, in effect, a tax which the rest of society imposes ex­clusively upon the poor for having saved up too much of their miserable pittance. This particular behaviour of a capitalist economy ensures that the median per capita income is always at a point of unstable equilibrium. The economy's natural gravitation thus pulls people away from the median towards the extremes of wealth and poverty. And this gravitation is non-linear. The strength of its pull increases the further you are from the median. It traps the poor in their poverty and the rich in their wealth. It isolates the poor in their poverty from the rich in their wealth. It divides society, leaving the majority desperately scampering towards the median up a downward moving escalator. If they stop running... down they fall into the pit of poverty. What a sadistic system! I can well hear the tax-payer's self-righteous indignation. "The deductions made from welfare on savings above £3,000 are not the same thing as interest or tax. Welfare is something the rest of society gives out of benevolence to the poor. Welfare is not a wage. The poor don't earn their welfare: it is given to them by us through our elected government. We, on the other hand, earn our wages. There­fore it is right that we do not give them as much if they have savings on which they can live." Welfare is not, and never has been, a gift to the poor from the rest of society. 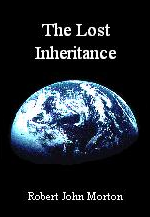 Nor is it adequate compensation or recompense for the natural inheritance which society has stolen from us. The provision of welfare is a selfish act by mainstream society to serve majority self-interest. It is optimised as the minimum pittance necessary to keep those who have been robbed of the means of transforming their labour into their needs of life just below the threshold of violent insurrection. The poor and un­employed would certainly be able to provide for themselves had society not forcibly cut them off from the means of doing so. In any case, the employed do not earn their wages in the generally understood (but actually incorrect) sense of the word. Hence, the poor and unemployed have a moral right to at least what they receive in welfare as an income. Any deductions made from it because they have exhibited the prudence to save it is therefore equivalent to levying a penalising rate of inter­est or tax on their savings. It is unjust. It is oppressive. It is sadistic. It is immoral. It is wrong. My prior notion of what one would generally mean by the word savings is as follows. It is money over and above what I required to provide my family and myself with the basic needs of life. It is money on which I am free to make an unpressured and unencumbered choice concerning how or on what I spend it and when I spend it. However, this is decidedly not what the government means by the savings of the poor and unemployed. In the context of the poor and unemployed, savings is taken to mean all the money one possesses. It includes all current bank account balances as well as what is in any form of savings or investments. It also includes cash. I am at a loss to know how savings in cash could yield a 20·8% ROI! Savings is deemed to include what you must 'save' to pay monthly, quarterly and annual domestic bills. It even includes the money that anybody with a disability has saved in an account from their special 'disability benefits' to meet needs resulting from their disability as and when they arise. Again, politics thrives on misnomer. I have mentioned elsewhere the total misnomer in using the word benefit to denote welfare payments. Even the word welfare itself is a misnomer. So now also is the word capital as used by government in the con­text of the poor and unemployed. Social Security booklets have gradually changed over to referring to the so-called savings of the poor and unemployed as capital. Thus if a tramp has a penny in his pocket he is deemed to have 'capital'. Capital, by its best understood definition, is that money or other economic means, over and above what one needs to live on and provide for the proverbial rainy day, by which one is able to command the labour of others for the purpose of generating profit. Thus to apply this term to the accumulated pittance of one who is poor or unemployed is not only inappropriate and grossly insensitive, it is also incorrect. If you are receiving welfare, the government (namely the Department of Social Security [DSS]) periodically checks how much money you have in any and all bank accounts you may have. They do this through unannounced spot checks. You are sent a form to fill. In this you are required to give details of your circum­stances, including your so-called 'capital'. You are required to enter the current balances (as at the end of the latest bank statement) for all your financial accounts and investments, plus all cash you may have. This includes what your spouse has also. They can swoop at any time. And they check only the spot amount on the day or on the last line of each statement. As I shall show, this is invariably anything but re­presentative of the actual amount of money you have on hand. The following is a commentary on the struggle to control the balances of my ac­count and my wife's account under the imposition of the DSS savings limit penalty. It is meant to be read with reference to the applet-generated account balances graph below. This graph applet shows the daily balance of our bank accounts for the selected year. The lower (yellow) trace shows the daily balance in my current ac­count. The upper (cyan) trace shows the sum of the daily balance of my current account and that of my wife's savings account. The horizontal red line is the DSS saving penalty threshold. Every time you select another year, please wait for the applet to pull the data from the server. 1991 1992 1993 1994 1995-97 1998 1999 2000 2001. My wife's account is reserved for accumulating her Disability Living Allowance [DLA] to meet specific needs relating to her disability. DLA is a non-means-tested 'benefit'. If you are deemed to be in clinical need of it, then you receive it - no matter how rich or poor you may be. I therefore think that it is wrong to include the balance of my wife's savings account in an assessment of personal 'capital' for welfare. It is not for the purpose of investing. It is not for the purpose of day to day living. It is there for the express purpose of meeting my wife's special needs. She should be completely free to choose when to save it and when to spend it - without penalty. That way, it could be managed properly to meet her clinical needs rather than be spent impulsively and inappropriately just to prevent it evaporating away at 20·8% or more above the rate of inflation. I do not think that any sensible thinking person would consider the cash-flow trans­ients (the maximum to minimum swing) in a current account to be part of what one could describe as one's savings. Clearly from the above graph, the only part of my balance which could be considered savings would be the (just under) £1,750 into which (since 1994) the cash-flow transients do not encroach. Including my wife's balance brings this minimum up to just over £2,200. 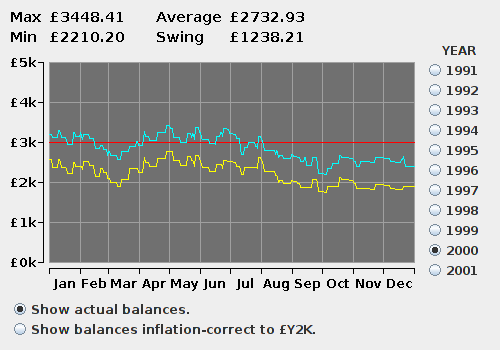 The graph shows that, during 1997 (the year of least swing), the balance of my cur­rent account meandered between £2,000 and £3,000. That is a transient amplitude of £1,000. That is a transient variation of around 50% of my intact savings. And, believe me, in order to minimise costs by buying on an annual basis where possible, it took very strict management to keep the transient even within this limit. I was using austerity to minimise transients produced by external events beyond my control. I want to make two things clear about the time since I became unemployed in 1991. During that time, my family and I have had no income in any shape or form other than welfare. My residual business activities during that period resulted in a considerable net loss. Up until 2001, my family and I neither acquired nor replaced any capital items such as vehicles or domestic appliances. All our outgoings had been for main­tenance and consumables only. This means that the ups and downs of my bank balance before 2001 have resulted solely from the assynchonism between welfare received and what we have paid for consumables and maintenance. This has resulted in a maximum to minimum range of just over £1,850. That is almost £1935 in £Y2K as shown in the adjacent graph. Obviously, this £1935 cannot generate income. You can­not pay the gas bill with money locked in a long term investment [see earlier graph]. The clear 'savings' be­neath the £3,000 penalty threshold is therefore only £3,000 - £1,935 = £1,065. This is the only part of our so-called 'capital' that could be remotely called 'savings'. However, were I to place this in a long term investment, I would be left with no contingency below my transient minimum. That is especially dangerous for anybody on welfare. Remember that one can only borrow money from a bank or hire purchase company subject to status. And for us, the poor and unemployed, that simply means 'no'. One final point here. If we had spent so little as £2.93 a week more than we did since I first stabilised my balance in 1994, that contingency buffer protecting us from destitution would have disappeared completely. But because we saved it, we have been penalised. We, the poor and unemployed, are ill-equipped to monitor and control the exact day to day balances in our bank accounts. This is especially true where the balances in more than one account have to be synchronised. Besides, the precise timing and sequencing of cheque clearances, standing order deductions and direct debits is wholly beyond our control or prediction. Without the ability to borrow (other than suffering the extortion of money lenders) we need to maintain a reasonable fin­ancial buffer. As I have shown from my own tightly controlled account, guaranteeing to remain just beneath the DSS penalty threshold is an impossible task. And our inevitable failure is hurtfully expensive. No commercial organisation is expected to operate on zero working capital. Its need for a monetary float to cover the assynchonism between income and exp­enditure is universally accepted. A trading company cannot function with all its working capital locked up in long-term investments. Why then are the poor and unemployed required to be more adept at financial management than company directors? Could a company operate knowing that if a large amount of transient money came through its current account that it would immediately start to evap­orate at between 20·8% and 520,000%? I truly think not! I was actually caught out. I thought it was now safe to allow our combined balance to drift above the £3,000 threshold. The reason was my confusion over an an­nouncement at the time of the April 2000 Budget. I heard that the threshold was going to be raised to £6,000. But this was not true. The DSS operative told me that it was still £3,000 and that she would have to make an appropriate deduction from our welfare payments because we had too much 'savings'. I checked on the DSS web site. No mention of the £6,000. Perhaps it may be implemented at a later date. But why confuse people by mentioning it just before the April 2000 budget? Political spin. To be seen to be helping the poor without actually helping us at all, rather leading us into a trap. We were first forced onto welfare in 1991. The savings limit was £3,000 then. To be the same in actual value, the savings limit in 2000 would have to be £3,864. That is almost 29% more than we were actually allowed in 2000. It means we would never have overshot the claw-back threshold in June 2000. Click the appropriate button beneath the daily balances graph to see the balances and penalty threshold in­flation-corrected to the Year 2000 value of the £. It seems that if, through iron discipline and thrift, we, the poor and unemployed, actually manage to save out of the reprehensible pittance the law says we need to live on, then 'the law' deems that even that is too much, and reduces what it gives us. Could those who enact the Laws of England ever be capable of imposing a more miserly and sadistic rule upon the poor and unemployed? Probably! But I hope it is not in my lifetime. So here we suffer, existing on even less than 'the law says' we need to live on, despite our being trapped in one of the most expensive commuter dormitories in Southeast England. Government political expedience notwithstanding, I, as a systems analyst, cannot rightly consider the intact £1,065 below the lowest excursion of my current account balance to be either savings or capital. I do not consider that I have a free and un­encumbered choice regarding how, on what or when I may spend it. My house is heated by gas. It has no fire place or even a chimney. It has no space to build either. The only technical alternative to gas heating is electric heating. This is prohibitively expensive. There is no economic alternative to gas. My gas boiler is almost 22 years old. That is 7 years beyond its recommended safe operating life. It has not been serviced for over 3 years. The service company did not want to service it any longer, besides which I could no longer afford the servicing cost while maintaining our domestic expenditure at a level less than or equal to our welfare income. Last year, my sister's gas boiler exploded. It got too old. Fortunately her gas boiler was installed in her garage. Nobody was in the garage at the time. Nobody was hurt. My gas boiler is installed in our kitchen. That is the most likely room for some­body to be. To have a new gas boiler installed would cost £1,500. I would gladly buy a book to learn how, and install it myself. That would be considerably cheaper. But I cannot legally do this without a 'piece of paper' to say that I am a qualified gas installer. And that 'piece of paper' can only be obtained by attending an approved course, which costs even more money. If our boiler failed in the winter, I would not have time for the DSS or the Local Authority to trundle though its lengthy bureaucratic procedures for approving a loan for a new boiler. Family health and safety demands that I get a new boiler installed immediately. I need that £1,500: not for if, but when that emergency occurs. Why don't I get a new gas boiler now so I don't have to worry? Because I don't know whether, in the meantime, an even more pressing family emergency may occur. And there are plenty if ripe candidates. My car is 12 years old. It is starting to become unreliable. I can do most of the serv­icing on it, which I do on time and by the book. However, there are certain jobs on the car for which I am wholly unequipped. There are certain jobs for which I am not a sufficiently proficient contortionist to be able to do safely or practicably without a full vehicle hoist. I have no choice but to have a garage do these jobs. That costs money. Usually between £300 and £600. Next, suppose I was eventually given a job. I would have to get there. One has to assume that they do intend me to get one. My new employer would not pay me for at least a month after I started. I would only get two weeks welfare after starting. Where would I find the £289.40 (Sorry! £285.40 because we are currently being deducted £2 a week because we have saved up too much of our welfare) for the second fortnight's subsistence. The only place I am likely to find a job within reach of my home is London. So where do I also find the £272.70 for the first one month rail ticket? Out of the £1,065 sitting below my current account transient. This means that my true contingency - my only 'savings' in the proper sense of the word - is therefore only £502.90. Consequently, that £1,065 buffer at the bottom of my account could disappear in an instant. In fact, given the state of my boiler and car, this grows increasingly prob­able. Please note that I have to keep this £1065 residue for emergencies. And re­member that we who live on welfare cannot borrow money from a bank, credit card or hire purchase company like ordinary people can. That £1,065 is not for the purchase of new capital luxuries like a digital television, a new washing machine, freezer, carpets or clothes. I certainly would not dare to spend it on a much needed holiday. It is a buffer against real, present and immediate emergencies which threaten our health and safety. It therefore has to be immediately accessible. It cannot be invested or locked up in a 'high-yield' savings account. Therefore it can­not generate income. sitting in my bank account alongside any money which was my own. Without my full accounts, it was not possibly to determine what was and what wasn't my 'personal capital' from the balance in my bank account. But common sense notwithstanding, the only thing the DSS and Local Authority look at when assessing my welfare deduction and Council Tax contribution is the plain simple balance in my account, my wife's account, plus of course any cash we may have to hand. It even includes any amount over £3,000 each that our children may have been given by grandparents or other benefactors for their future education. There are two further rankly unfair consequences of the savings limit penalty. There is much greater potential for my finding work appropriate to my skills in places other than the locality in which I now live. The demand for my skills over the past 10 to 15 years has rapidly polarised into fewer larger concentrations such as the 'M4 Corridor' in the UK. But I cannot move there, or anywhere else, for two main reasons. Even the whole of my current so-called savings could not finance the move. Once I sell my house and realised it as 'capital', I lose my eligibility for welfare. The consequence of the latter is that my capital would be evaporating not at the ≥ 20·8% as before, but would be draining away all the time until I had found and bought a house in the more appropriate locality and found a job there and received my first cleared salary payment. The maximum £3,000 'savings' would be drained away completely in 21 weeks just by continuing to live in our present torpid state of welfare subsistence. I would not be eligible for a mortgage until I had established myself in my new job. I would have nothing with which to buffer the assynchonism between my domestic outgoings and incomings. I would have nothing for emergencies. I would have nothing with which to meet the cost of moving and adapting our furnishings to a new house with different sized and shaped rooms and windows. In short, the arithmetic doesn't compute. It just wouldn't work. So here we remain, trapped indefinitely in this dead suburban commuter dormitory. Suppose I had to sell our ageing and unreliable car with a view to putting the money towards a newer one. From the time I received the money for the sale to the time I found and paid for the new item, the money would show up as 'capital' in my account. It would therefore, during its stay in my account, evaporate at a rate ≥ 20·8% per annum. If a spot check were done on my account during that time, I would have to wait for the next bank statement after the purchase to prove that it was no longer in my account. And then they would investigate to see why I had got rid of it so quickly and whether they considered the expenditure 'acceptable' or 'unnecessary'. We are economically trapped in a locality where it is universally accepted that a car is essential in order to be able to function normally. This could easily leave my wife with no means of getting about - even to do shopping and attend her disability drop-in. What a contrast to our neighbours. All but one other family in our street has at least two cars. Many have jeeps and vans as well. Two couples have 4 vehicles each. Apart from a Morris Minor hobbyist, my car is the oldest in the street. It is certainly by far the oldest main family vehicle. No wonder there is no public transport within reasonable reach. While unwillingly economically inactive, one can safely keep up to £3,000 on hand. In 1993, our first 'stable' year after I became unemployed, our fixed bills came to £2,037.69. Almost 3/4 of this was payable around one time of the year. I therefore had to accumulate around £1,500 out of my welfare in my current account to be able to make these payments at the right time. I also need another £1200 to finance us over the 2 months required to re-apply for benefit when it is un­predictably stopped. Therefore my maximum possible theoretical savings could never have been more than £300. This was not even an adequate contingency in case of necessary vital house repairs or if a major appliance had needed replacing. This would have required a saving of £1,700 a year over the average life of a major appliance, which is 5 years. An extra amount of £8,500 would have to accumulate. With the £1,500 required to meet bills and the benefit termination contingency, a total upper savings level of £11,200 would have to be allowed. As things stand, there are 'a thousand and one' things which could gobble up our entire financial contingency in a trice. For instance, we have a toilet which we have had to flush with a bucket for over 4 years now. The flimsy plastic tank wore out years ago. It is irreparable. The toilet itself is cracked. It needs replacing completely. This is in 21st Century Britain!! I would gladly fix it myself if I could afford the parts and knew how to do it. Being economically imprisoned, here as I am, I can get nowhere. To get back into work from my present circumstances, I would need to get on the phone for long periods without fear of the cost. I would need to spend a large proportion of my prime time on the Internet and attend industry seminars in the UK, Europe and the US. In other words, I need to be seen around. I would need money to travel. I would need money to stay away from home. I would need money to be able to socialise with the right people. To do this I would need at least £10,000. To break out of my prison of economic inactivity, I would therefore need to be able safely to accum­ulate or borrow a critical mass of at least £20,000 in 'savings'. State welfare is inadequate to meet our basic needs of life. As it becomes pro­gressively reduced when savings exceed £3,000, there is no option but to meet the shortfall from savings. When one's savings exceed £8,000, they become one's only source of income. The effect of the savings limit cannot therefore be other than to drain off any savings in excess of £3,000 until they are gone. It is like a hole low down in a water tank. The tank can never fill beyond a small fraction of the level needed to meet the assynchonism between in-flow and out-flow and hence provide a steady reliable supply. Borrowing to finance my self-marketing would send my bank account balance to well over the £3,000 limit. Day to day living costs of my family would simply be switched from being provided by State welfare to being provided by the borrowed capital. Furthermore, the interest on the capital I borrowed would have to be paid out of the capital itself. Borrowing in principle would therefore be self-defeating. The savings limit is the most effective mechanism I can imagine for locking a person in my position into a permanent state of economic inactivity. It is so effective that I find it hard to believe that it was not set up deliberately for this purpose. Perhaps it is a part of some kind of sick economic policy designed to lock out a certain pro­portion of the workforce as an incentive to those with jobs to work hard and refrain from demanding too much in return. The savings limit locks those of us whom it affects into permanent economic inactivity. Hence it locks us into permanent poverty. Even what others may give us is taken away. It means that what others take for granted, we are denied. We cannot give our daughter a wedding. Our son is denied the tertiary education for which he has worked hard and qualified well. Ours are vacant memories of other's foreign holidays as our children have grown up. We cannot pursue a hobby or recreation. We cannot even put aside for our retirement or even our funerals. The savings limit imposed on the unemployed thus stifles and frustrates all the ancient virtues of thrift, prudence and self-sacrifice. It prevents us from ever accumulating enough financial fuel to achieve our economic escape velocity, thus keeping us marooned forever upon the Planet of Poverty. We are not protected by a written constitution. We have no inalienable rights. We have rights only as granted to us from time to time by Parliament. Parliament is free to withdraw rights as well as to grant them. A socialist government may raise the penalty threshold on the 'savings' of the poor. It might even remove it altogether. But there is nothing to stop a capitalist government re-enacting it - or even something worse. And in any case, no government is likely to compensate the likes of me and my family for the decade of economic imprisonment it has already bound us undeservingly to serve. I find myself irresistibly compelled to speak out. Who are the authors of this in­sidious savings limit penalty? "I don't know whether the world is run by smart men putting us on, or by imbeciles who really mean it." caption from 1970s political cartoon in "Punch" magazine. I do not think they are imbeciles. I think they are 'sadists by default' - just too damned lazy to solve a problem which isn't hurting their own fat selves, but over which they jealously retain exclusive control. They are cowardly power-seekers who hit those with no means to fight back, depriving the poor even further to feed the greed, leisures and luxuries of a self-centred self-satisfied inductively deluded voting majority. As for us, a fair and equitable system is obviously too difficult or expensive for them to police. So they leave us to suffer. We are expected to abide by their laws with their soothing words that if we've nothing to hide we've nothing to fear. But poverty is a fearful thing, and one always has plenty to hide and plenty to fear from an omnipotent thief. Human society naturally comprises individuals, families and communities. Beyond the physically collocated family unit, human society is essentially a complex dyn­amical system - a fluid of family molecules. It has no natural formal macrostructure. Even the natural state of human society is merely an egalitarian overlap of personal coteries. But modern industrial capitalism and its derivative governments, have destroyed the community. They are now in the process of destroying the family. They will eventually reduce the individual to nothing more than an expendable economic re­source. They have forcibly restructured society into gigantic corporate entities and economic sectors under a labyrinth of interlocking hierarchical control systems to which all other social constructs are now no more than peripheral. Disparity, depriv­ation, poverty and exclusion are the unwelcome fruits of their endeavours. Corporate hierarchies and economic classifications exist only in the minds of those who seek control. They think that by force of law they can regiment the molecules of the wind to march in rank. Fools! Forget your vain analyses of the national ec­onomy and its global markets. With a complex dynamical system, one should look to the little things. One should think in terms of a systematic model of the family within its local hinterland. This should reflect the family's every conceivable social and economic circumstance. Human society needs a logically robust protocol through which every individual and family can interact with the rest of society without fear of violence, deprivation, exclusion and poverty. A sound political manifesto that pro­tects everyone's fundamental right to his fair share of our planet's natural means of turning work into wealth. Take care of the family, and the nation will take care of itself. Just for the record: I did spend far less than the DSS penalty limit of 16 hours per week on my business from 1991 to 1997. I spent the rest of my time on the futile chore of actively seeking work with an employer, as the law required. I also spent time updating my skills.